Have you always wanted to visit Hawaii but thought a vacation of this type was well outside your budget? Between the cost of the flight and a hotel room, it might cost more than you think. Well think again as The Shell Vacations Club at The Holua Resort offers an alternative for those looking to save money. Instead of spending lot of cash on a hotel room, you can spend even less for a gorgeous timeshare that will welcome you back year after year. If you like traveling on your own, with your spouse or some friends, you might buy a Shell Holua Resort timeshare one bedroom unit. These units come with a king size bed in the private bedroom and a comfortable sofa that folds out into a queen size bed in the living room. When you travel with others, you might like one of the two bedroom units. Though all have a king size bed in one room, the second bedroom comes with either twin beds or a second king bed as well as a pullout couch. Your villa will also feature its own private lanai or patio that either overlooks the mountains or golf course. Shell Vacations Club at The Holua Resort lets you experience the ultimate Hawaiian vacation. With several large hot tubs and eight impressive swimming pools, you may not even want to head to the beach. You'll find that you're only minutes away from major shopping destinations, state parks, gorgeous beaches and waterfalls. Surfing, scuba diving and other water sports are also close by. No matter what you do on your vacation, when you buy a Shell Holua Resort timeshare, you'll experience pleasure and excitement like never before. 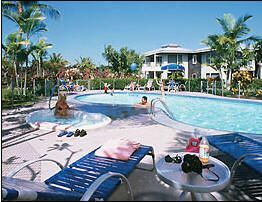 Contact Shell Vacations Club at The Holua Resort Specialist Today!